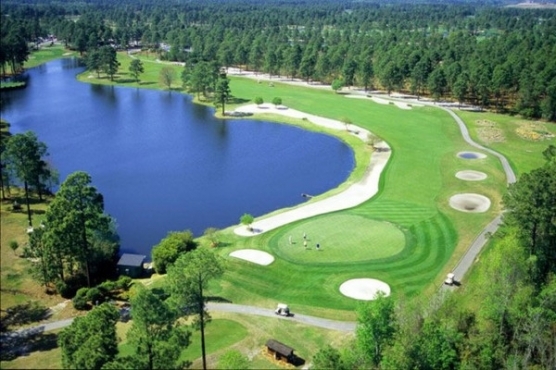 Rivers Edge Golf Club in Shallotte, N.C. is currently closed for various improvements and greens replacement. The owners and operators of Rivers Edge decided to close the course for a couple of months to make these improvements. Rivers Edge is a 16-year-old Arnold Palmer design that stretches to 6900 yards. It will be the first Grand Strand course to close to install the Sunday variety of ultradwarf Bermudagrass on its greens. In 2009 Rivers Edge replaced its L93 bentgrass greens with Paspalum grass. The Paspalum grass is a hearty grass that is very salt water and drought tolerant grass that also takes stress off a course’s water supply. This past winter some of their greens suffered damage from winter kill as did several Grand Strand courses. East Coast Golf president Mike Buccerone stated that over time the Paspalum did not react well in the winter months and the transition and in an effort to produce a product that everyone expects the decision was made to shut it down and do it right. Rivers Edge is one of the area’s most scenic courses that features several holes along the marsh and the Shallotte River. The Sunday variety of grass is salt-tolerant and it is cold tolerant with a blade that is a lot smaller than Paspalum so Rivers Edge will be able to get the greens speeds up to what people expect. Other improvement that will be made while the course is closed will include drainage work and tree removal on some holes where the turf suffers from excessive shade. “We’re excited about the ownership and membership embracing this and we’re looking forward to a good fall,” said Buccerone, who added that East Coast’s other courses will accommodate The Rivers Edge members while the course is making these improvements.